This is pretty difficult to find, but if you can get it, don’t hesitate to pick it up at once! This EP is produced by “That Kid Named Miles” productions so you are reliable getting a strong, jazzy compilation where beats are dug DEEP from the crates and you’re guaranteed to listen to each without hearing a lot of cliche or generic rhymes. T-Love also is backed up by a myriad of strong freestylers, Siah and Yeshua, and the freestyle nutball god himself, Kool Keith. The overall sound of this album is jazzy, laid back and smooth, but at the same time, T-Love can deliver at an aggressive, inspiring tone without getting out of control. A well controlled production with a tight, uniform style. 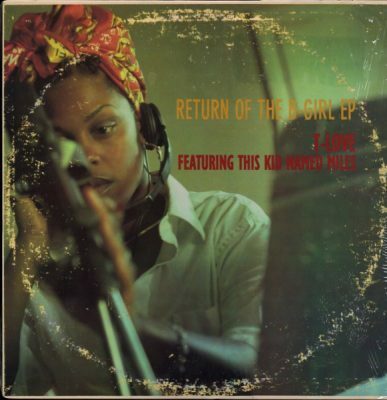 comment "T-Love & This Kid Named Miles – Return Of The B-Girl EP (CD) (1998) (FLAC + 320 kbps)"